The dominant feature of the village is the Church of St James the Greater. Interior of the church is decorated with sculptures by Mathias Bernard Braun, and the altar paintings were made by Václav Vavřinec Reiner. In the south-western part of the village stands a three-winged chateau. Out of the original set of 44 Baroque stone sculptures just a few have survived to this day, the oldest one being the Holy Trinity Column from 1680. Built on the highest point of the village, the Church of St Bartholomew is the dominant feature of the village of Smolnice. When you climb the tower of the church up under its dome, you may take pleasure in viewing the picturesque village below and the beauty of the nearby České středohoří /Bohemian Middle Uplands/ and the distant Ore Mountains. Along with the rectory, built in the second half of the 17th century, and the old linden tree at the entrance to the rectory it forms an impressive and harmonious unit. The incomplete Gothic cathedral, the artistic value of which ranks it among one of the most accomplished Czech sights, belongs to the most notable and mysterious places in the Czech Republic. It consists of a 21 meters long chancel and the unfinished walls are about 20 meters high. According to psychotronics, the place emanates strong energy with curative effects. Whether you feel the healing effects on yourself, or not, Panenský Týnec is really worth visiting. About 1 km south of the village is the largest Jewish cemetery in the Ústí nad Labem Region. Some 300 tombstones have been preserved, while the oldest ones date back to the mid-18th century. The ancient agricultural village of Peruc is located above the wooded relief bend that falls into the wide valley of the River Ohře /Eger/. It has been long since this landscape became one of the most attractive parts of the whole vast Louny area. People mainly became to know Peruc thanks to the old romantic legend how the Slavonic Prince Oldřich met the washerwoman Božena. This romance was first recorded by the chronicler Kosmas at the beginning of the 12th century, who was later followed by the chroniclers Dalimil and Václav Hájek of Libočany. History has left quite a few of the notable monuments in Peruc. The village square is dominated by the Church of St Peter and Paul with its impressive façade and valuable internal equipment. In addition, a small belfry and an undated wayside stone cross have been preserved. However, the most sought-after is the Boženina studánka /Božena´s Well/ with a neo-Gothic roof, past which you can descend to the ancient massive Oldřich´s Oak. The circumference of its trunk is 745 cm and age of about 1,000 years. Opposite the church is a three winged Rococo chateau with a beautiful garden. Other interesting stops in this village can be the Czech Village Museum, the Gallery u Jednorožce or the Gallery at Plazík; or take a stroll in the nearby local woods up to the Beautiful Scenic View, also called the Svatopluk Čech´s Scenic View /S.Čech was a Czech writer in the 19th century/ - a popular tourist place. The local single-nave, originally Romanesque Church of St James is significant especially thanks to its Gothic frescoes in the presbytery. Next to the entrance to the church is the tomb of the Czech poet Konstantin Biebl, a native of the village. The valuable Baroque rectory, built between 1753 and 1759, has been preserved in the neighbourhood of the church. In one of the vertexes of the triangular square is the statue of St John of Nepomuk with a Baroque pedestal. Before the village, on the right side of the road leading from Veltěže, is the octagonal Baroque Chapel of the Visitation. On the north-western edge of the village, under the solitary linden tree near the railway stop, is the menhir Baba, an iron sandstone which is 1.9 m high. In Slavětín you can also visit the agroturistic family farm that breeds a lot of kinds of animals. The attraction of this village is the Church of Promotion of the Holy Cross from the 14th century and the newly opened outlook point U křížku /At the Cross/, located on the top of the Kněžský vrch /Priestly Hillock/, in front of the entrance to the village from Slavětín. 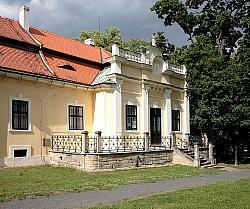 Chateau Pátek was built after 1692 in the Renaissance style on the grounds of the former Gothic fortress, which was demolished after the construction of the chateau. Today, the chateau is empty; there is only an exhibition about history of the village, which is open to public during summer holidays only. 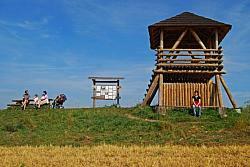 Near the village is a small wooden observation tower called Stradonka. It was built on the site Na Valech (291 m), where a Celtic settlement used to be in the past, and therefore the observation tower was also built in the shape of a guard tower of the Celtic fortifications. The observation tower is just 6 m high, the viewing platform is at the height of 2.35 m and is accessible only on a ladder. Free access. Here you can see e.g. the Church of Saint Anthony of Padua, the late Baroque building from the year 1752, or the statue of Saint John of Nepomuk dating back to 1729 with a sculpture of Queen Sophia, King Václav IV´s wife, on its pedestal, or a column with a statue of St Lawrence, as well as the mill from the turn of nineteenth and twentieth century with an Art Nouveau part of residential buildings. The Karfíkův Dvůr /Karfík´ s Court/, a family farm, is also of a great interest and also offers, in addition to the processing of different kinds of fruit into generous brandies of delicious flavours and aromas, bicycle and boat rental, as well as hippotherapy and reconditioning, regeneration and massage services. The surroundings of the village are rich in natural attractions. Geologically famous is the Koštická stráň /Koštice Slope/ along the road from/to Orasice which abounds in marlite and cretacerous marl with large amounts of Cretacerous fossils. Along the road to Libochovice, near the railway line, is a waterlogged meadow with an abundance of halophilous plants and rare species of insects.